Adjudicated properties are coming to market over the next few weeks, so now is a good time to review how to purchase real estate at rock bottom prices when a property owner has defaulted on the mortgage. Often commercial real estate properties that are in trouble have defaults by the property owner on mortgages, contractor work, and taxes, in addition to deficiencies by city code and fire code violations. The property owner may not wish to sell because the property’s decline in value no longer brings enough cash to cover all the debts. The result is a stalemate where the property is never put to the highest and best use; therefore, debtors no longer receive a return on their investment and the property declines in condition and becomes less valuable. 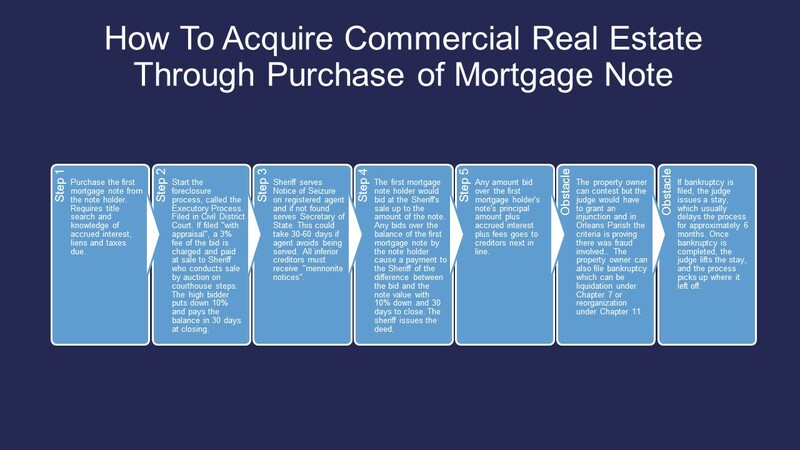 One solution is to acquire the property by purchasing the mortgage note. The benefit is that once you own the first mortgage note, which gives you the senior lien position, you can foreclose on the property which eliminates all liens on the property, except for tax liens and SBA loans. If you own the mortgage note and the property goes to auction at a Sheriff’s sale, the proceeds are paid to you up to the face amount of your note plus interest and fees. If you buy the property at auction, you will pay the Sheriff a 3% fee in Orleans Parish, but you only have to pay the Sheriff the difference between your bid and your note. You may have to bid against other bidders, but if you bid the face value of the note and are outbid, the high bidder makes payment and you receive your note’s face amount. If you are the high bidder then you receive the deed from the Sheriff within 30 days.